Some people have asked what led me to write Wild Wolf Encounters. Like all creation, it was the result of a struggle. In this case, it was a struggle with myself. About two years ago, in another crisis economic compromise, Congress removed wolves from the protection of the Endangered Species Act. Under this Act, wolves re-introduced into the Rocky Mountain region of the United States had flourished, their numbers increasing to about 1700. Without the Act’s shelter, wolf hunting is now permitted in Montana, Idaho, and Wyoming. The stated goal is to reduce wolf population to ~100 individuals per state. That’s a lot of hunting. Animating the hunt is the prevailing idea, nurtured by age-old tales, that wolves are vicious creatures, dangerous to people; that they kill for pleasure; and therefore, that they deserve to be (re-)exterminated, or something close to it, although now it is called “management”. I struggled to find an appropriate response, something I could do besides writing letters and sending e-mails to politicians. And then I realized that what I could do best was to share my own experiences with wolves in the wild. There I find them to be curious about humans, beautiful beyond believing, fascinating in a way that cannot easily be explained, and utterly without threat. 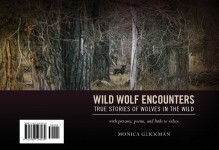 Wild Wolf Encounters is my way of undoing, one story and poem at a time, a painful and dangerous myth. Something similar provided the motivation to write and publish the poems in Songs for a Beloved Friend. A few years ago, while traveling, I saw an animal welfare organization’s ad in a national magazine. The ad showed a calf, raised for veal, living its life in a tiny stall, unable to sit, lie down, or turn around. The animal’s face was turned toward the viewer, and the eyes scorched me. I couldn’t look away from those eyes, even though I wanted to. I very much wanted to turn the page and forget about it. I tried and had to turn back. I tore out the ad and placed it in my purse, so I would remember there was something I needed to do when I got home. What that something was, I had no idea. But I felt it needed to be life-changing. Returning home, I saw the picture and began a struggle, again with myself, about what my response could or should be. Not a writer except professionally, I never aspired to or imagined I could write poetry. I’m a lawyer, so I inquired about teaching animal rights law at the local law school. What did I know about animal rights law? Not much, except I assumed the body of law would be short if not sweet. Anyway, lawyers can teach themselves about almost anything law-related. No luck – position already taken. Now what? As I pondered, I stopped playing the piano – not unheard of for me – and stopped reading. Definitely unheard of. I wondered about this as I contemplated what could be happening. After three or four months, the poetry began to flow. Wave after wave of it. OK, so this is why I couldn’t read or play music, I thought. Add to the mix of music and language, a devotion to yoga, which strengthens the voice and permits an understanding, at the somatic and visceral level, of the connection between all things, and Songs was born. Songs for a Beloved Friend is my response to those eyes. Wild Wolf Encounters is appropriate for adults and children. 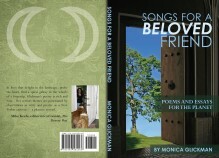 Songs for a Beloved Friend is a book for adults. Please note that both books are available for free download using the sidebar links. This entry was posted in blogging, books, music, Nature, Poems, politics, wolves and tagged animal rights, animal welfare, books, creation, Endangered Species Act, law, music, poetry, politics, Songs for a Beloved Friend, struggle, wild wolf encounters, wolf hunting, wolf management, wolves, writing, yoga. Bookmark the permalink. Thank you so much, Diana! Don’t they all mix together in such a nice way?! Add to the mix of music and language, a devotion to yoga, which strengthens the voice and permits an understanding, at the somatic and visceral level, of the connection between all things, and Songs was born. I LOVED this (as a musician, linguist, writer, and fan of yoga). danke dir für deinen Besuch und diesen Kommentar! Dear Bluebee, Thank you so much for this wonderful and generous comment. I feel like I have applied a band-aid to my heart. I feel a bit better, but it falls off, and I have accomplished nothing. Struggling again to find another way. “I struggled to find an appropriate response” – but ultimately you did; you did not throw it in the too-hard, too-busy basket. It is the measure of you, Monica, that you continue to try and make a difference. Liebe Gislinde, Danke für deinen Besuch und das Lesen der Geschichte. Manchmal kann der Übersetzer ein zweischneidiges Schwert sein. Ich weiß genau genug Deutsch zu verstehen, wenn es falsch ist, aber nicht genug, um es zu beheben.